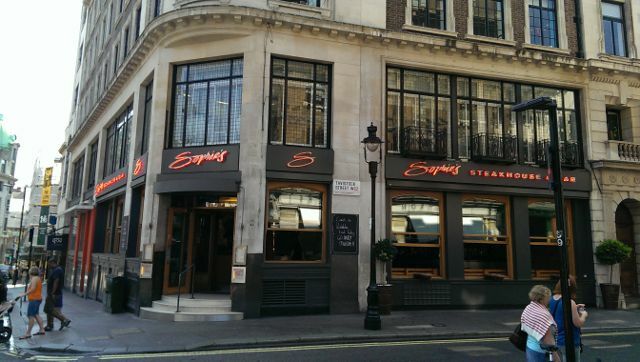 I fancied giving a Sunday lunch in Covent Garden a go, and eventually settled on Sophie’s Steakhouse. Claire and I had eaten there pre-John William, so I was looking forward to the experience. The venue was bright and breeze, with unusual lights hanging down from the ceiling. With light walls, stone columns and open kitchen, Sophie’s had a oxymoronic feel of luxury and industrial – I liked it a lot. 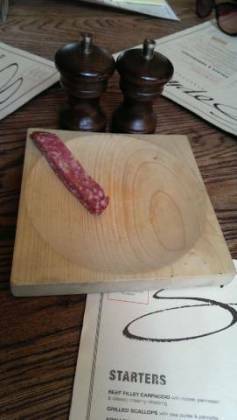 We were also given sliced salami to nibble on whilst waiting for our friends – unfortunately I ate most of it before taking a photo… A very nice touch. Friends arrived, they ordered a bottle of Heinekin each – £3.95 a bottle. I also asked for a Meridian Wheat Beer, at £4.25 / bottle. Why am I talking so much about the cost of beer at Sophie’s? Cause it was expensive! Essentially, a pint of London Brewery lager was just shy of £6.00! Anyways, food orders were taken – we passed on the starters (with the view we’ll try the desserts :-)). Claire ordered the roast beef (cooked through), I ordered the roast beef as well (the standard serve was rare). Our friends ordered roast beef and a classic burger. 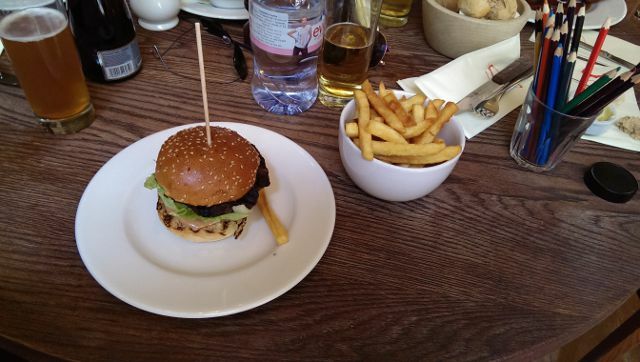 They were speaking about ordering something for their son, but decided against it – I realised later in the meal that kids actually eat free on Sunda’ys – we could have shared the small burger and dessert! At least we know it’s family friendly for another visit. Our main courses came out quickly. The beef, roast potatoes, Yorkshire pudding and gravy was served on a plate each, the vegetables came out in dishes for us to help ourselves. The roast beef was cooked perfectly (what could I expect from a steak house?). A few thin slices each, good flavour and seasoning with pepper. Claire was as pleased with her roast beef (well done) as I was with my rare version. Both were delicate to the taste and tender to the knife. The (3) roast potatoes were quite nice, garlic and pepper flavour was coming through well. The horseradish served seemed homemade, Claire enjoyed it and I had a quick taste (hot, hot, hot – whilst being a bit creamy). The cheesecakes were presented well, a small-ish slice garnished with mint and a berry / coulis. 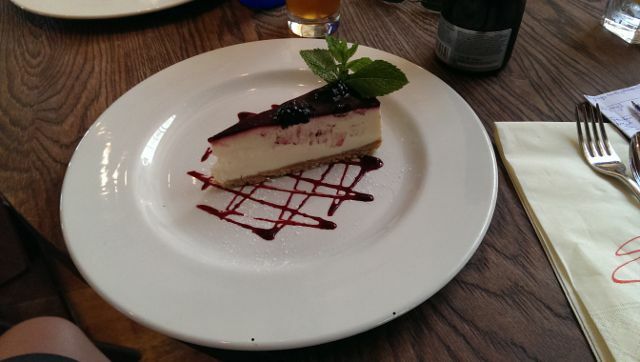 Tucking in, it has to be one of the best cheesecakes I have ever eaten. The vanilla and cream cheese was excellent, such a smooth taste and texture. I thought the slice was a bit small, but definitely worth ordering. So, on to a conclusion. The service here was excellent, very personable and friendly. The venue was industrial with a contemporary twist, but still comfortable. The Sunday lunch, whilst quite a high price (I believe the most expensive we have reviewed to date), the quality of the food was excellent. 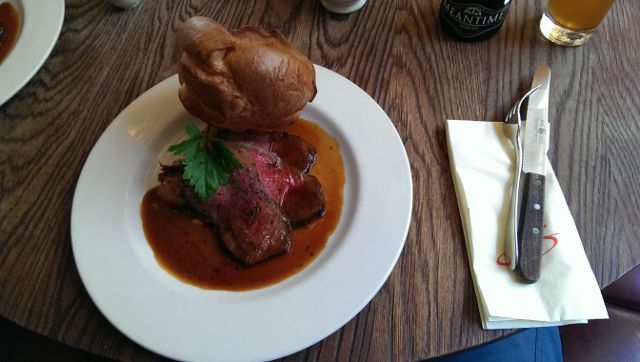 The roast potatoes were enjoyable, as was the Yorkshire pudding and the (delicately flavoured) roast beef. I really enjoyed the free salami as a nibble, a good touch. I wasn’t keen on the cost of the drinks, the lager was almost twice the price of a local pub (fair enough, it was a “better” brand, but still…) I would also have liked extra types of vegetables for the cost – a bit more inventive selection such as cauliflower cheese (shock and horror I want that!) Also, Sophie’s: please let people book tables, as it would have made the lunch more convenient for us. 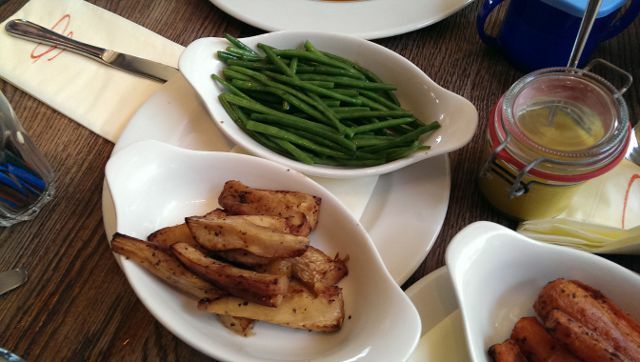 But, with the “kids eat free on Sundays”, and the excellent quality food and service, Sophie’s safely scores 4.5/5.